So we’ve talked about books, we’ve talked about a fair few of them. And we’ve talked about a bit of telly. And movies, we like our crime thriller movies, and radio. So let’s move on and talk about this here audio drama. An audio drama is, like, radio without the shipping forecast, right? You can listen to it anywhere — in the car, while you go for a run, while you’re on a stakeout. Six Degrees Of Assassination is a gripping thriller about the murder of the British Prime Minister which is available to download from Audible.co.uk to a host of devices. The action follows an MI5 investigation into the assassination of the British Prime Minister. Six people, from assassin to mastermind, are unravelled from a web-like, complex chain of command — each of them a vital step towards uncovering the truth. It’s action-packed and, because it’s pumped right into your lug holes, unbearably tense. Six Degrees stars Andrew Scott, him from Sherlock, and Freema Agyeman, her from Doctor Who, and Hermione Norris, her from all sorts. And the writer M.J. Arlidge is quite the person at the moment. A television scriptwriter — Silent Witness, Torn, The Little House and Undeniable are among his credits — Arlidge became this year one of the biggest novelists in the business with his procedural Eeny Meeny. 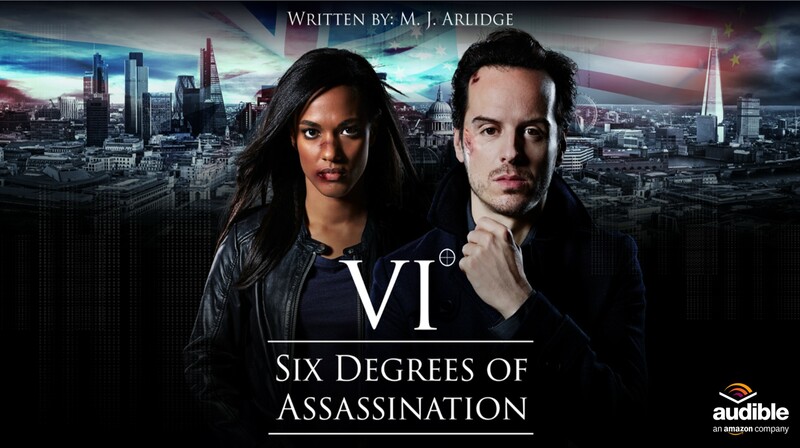 Six Degrees is a ‘What If’ thriller about the assassination of the British Prime Minister. It introduces a new MI5 hero – Alex Cartwright – and is a cross between 24 and Homeland. Someone once famously said the pictures on radio were better – are you able to let your imagination off the leash doing an audio drama? Absolutely!!! I work in TV for my day job, but could only dream of doing what we do in Six Degrees. Explosions, car chases, assassinations, helicopters – it’s got the lot. What’s that feeling like when you hear actors bring your words alive? Amazing. We were so lucky to have such a stellar cast – Andrew Scott, Freema Agyeman, Hermione Norris — and they were uniformly brilliant. Andrew and Freeman make such a thrilling but charming pair and Hermione is so intelligent and sophisticated. I couldn’t have asked for more. Why do we love conspiracy thrillers so much, do you think? Because they produce a pleasurable paranoia! We love Russian Doll thrillers in which you are never sure who to trust or which agenda to believe. They are a great ride and always keep you guessing to the end. What’s not to love? You’re both a scriptwriter and novelist, these days – how do you fit it all into your writing schedule? It’s a juggling act, but it’s very refreshing — and challenging — to go from one medium to the other. It keeps you fresh and each informs the other. You never stop learning! This entry was posted in Audio Drama, Authors and tagged 24, Eeeny Meeny, Homeland, MJ Arlidge, Silent Witness, Six Degrees Of Assassination, The Little House, Torn, Undeniable on December 8, 2014 by Crime Thriller Fella.